Dendropoma maxima is a sessile snail that lives in tubes in the reef limestone. It occurs on the reef flat until about 1-2m water depth. In these photos it is embedded inside the fire coral Millepora platyphylla. It does not bore into the coral, but rather builds its own tube and is overgrown by the coral at the same pace the coral grows. It also occurs directly on the reef limestone. Dendropoma maxima produces nets of sticky mucous with which it collects its food (visible in the photos). This is the largest vermetid snail. The tube can reach several 10s of cm in length and usually not coiled at all or slightly coiled or twisted at the end. 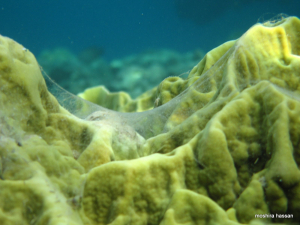 The tube may also follow the contours of the substrate (coral). The opening of the tube in these photos is about 1.5cm in diameter. It is closed by an operculum.